Troy University IT has implemented Microsoft's Advanced Threat Protection (ATP) service as part of our ongoing cybersecurity initiative to protect TROY’s network, infrastructure, and clients from malware and unsafe links, such as those that have appeared in recent phishing scam emails. 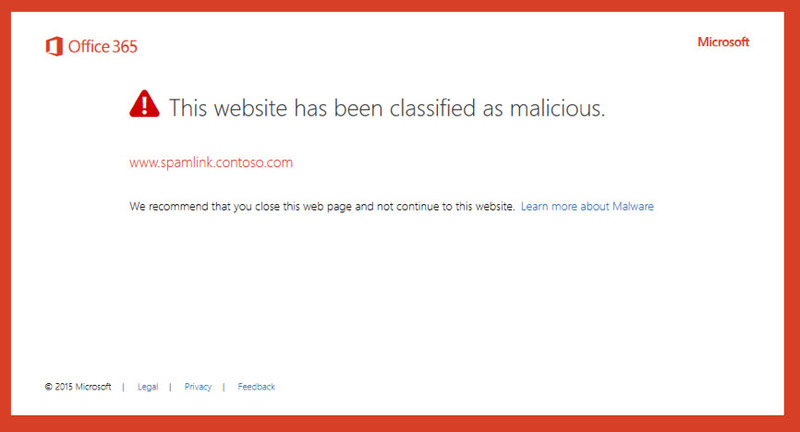 ATP analyzes incoming email and blocks malware and unsafe links. ATP provides two-part protection: Safe Links and Safe Attachments. This feature checks email message attachments for malware and viruses. If an attachment is found to contain malicious content, the email will be blocked. Please Note: Currently, Safe Links are applied only to the links sent from non-TROY addresses. In the upcoming months, SafeLinks will be applied to all internal and external emails. This service does not guarantee that all links which are scanned are safe, but does guard against many known unsafe sites and is continually updated with new information about malicious sites. Which email accounts will be protected by ATP? ATP protection will be enabled for all Faculty, Staff and Students who use Troy University’s Office 365 platform. Alumni accounts are not covered by this protection. No. All Troy University Office 365 accounts will be protected. Cyberattacks are becoming more and more sophisticated and there will continue to be events that may circumvent these safeguards. Office 365 is a cloud-based platform that Microsoft continues to improve, and they will continually update the detection functions within ATP, which will help to protect Troy University from future cyber threats. 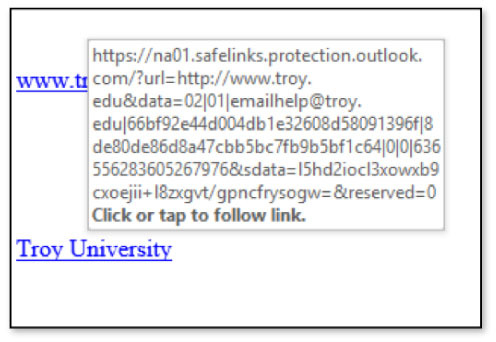 Due to the recent increase of sophisticated phishing attempts, Troy University IT is asking that users no longer include clickable hyperlinks in emails. Instead, we recommend providing brief instructions on how to access the hyperlink along with any additional information that is needed. Note that most devices and/or mail clients now enable smart links which scan the content and automatically create hyperlinks for telephone numbers, addresses, possibly meeting times and other discoverable data. TROY IT encourages you to avoid clicking on any links, even if it is from a trusted source. Instead, enter the address directly into your browser and/or contact the source to verify the content. You may also forward any suspicious emails to spam@troy.edu for review. Please submit a Helpdesk ticket if you suspect that ATP may be blocking legitimate links and/or attachments.